Guys, I cannot tell you how excited I am to be checking this off of my 18 in 2018 list! Thank you, Gretchen Rubin, for the idea of creating this list because it has seriously motivated me to work on all kinds of things I have been putting off. I FINALLY have my own, dedicated art space and it is just such a joy. I had put this off for a long time because I didn't think we could possibly have space for me to have a "studio." We live in a 760 square foot, 1 bedroom condo in D.C., so I was pretty certain there was no chance. But, we had a blank wall leading into our bedroom. When I started painting bigger pieces that didn't fit on my music stand or kitchen table, I would sit on the floor there and lean the canvas against the wall and I started to think that I could really fit everything I needed right on this wall if I just used the space wisely. I am SO incredibly happy with the outcome. I love having my supplies accessible, but organized. I love just seeing this space every time I walk by. It keeps me motivated to paint every day and I look forward to being here at the end of each day so much. My husband and I (labor was 99% my husband, but I consider myself the brains behind this design) were also able to put this together in a weekend, so it was relatively simple. The total cost of supplies was around $120, and we have some extra wood from the shelf that we'll be using for upcoming projects. Mount your drop-leaf desk. I have seen projects to make your own, but given that it was relatively inexpensive, we decided to buy ours and followed the instructions that came with the packaging to install it. I like to work standing up so I had M mount it so I could comfortably reach everything while standing barefoot, but you could easily set yours up to chair height. Gather your supplies and have the hardware store cut down your dowel and board to the length you want. Sand your board and apply a sealant. I just used some matte spray that I already had. You could also stain it if you prefer that look. Mount your shelf, using the two brackets and screws. M pre-drilled the holes and then used an electric screwdriver to mount everything to the wall. He also used a level to make sure everything was even. Screw the screw eyes into the bottom of the shelf where you want the bar to be. It helps to pre-drill these holes as well if you have an electric drill. Add the dowel. You should be able to slide it through easily. Add the S hooks and your supplies. Now get creating! I've been working on checking things off of my 18 in 2018 list (inspired by the wonderful Happier with Gretchen Rubin podcast) and one of the most fun things on my list is to go on weekly dates with my husband. We've been married for almost two years, but have been together for over 10. As you can imagine, it's easy to get into a routine when you've been together for so long. Our weekly date nights have been so fun to plan and have been a wonderful way to spend quality time together, usually doing something new. Visiting museums! We're lucky to live in a city full of some of the best free museums, Washington, D.C. I can't wait to visit the Hirshhorn's upcoming exhibit, PULSE or see some old favorites at the National Gallery. Even if your city doesn't have many free museums, most museums offer one free day each month, often on the first Saturday or Sunday of the month. Getting outside. I'm especially excited to hike some new trails this spring/summer and to check off another item on my 18 in 2018 list---camping! I'm excited to go to Shenandoah National Park, but am also looking forward to visiting some smaller state parks in Virginia and Maryland as well. When we don't have a full weekend to spare, I am definitely looking forward to renting bikes and riding around the monuments. Trying new activities together! I just heard about Bad Axe Throwing opening in D.C. and am excited to check it out. Other ideas: splashcycle at the Watergate hotel, renting a kayak or stand-up paddle board, or playing the indoor mini golf course at H Street Country Club. 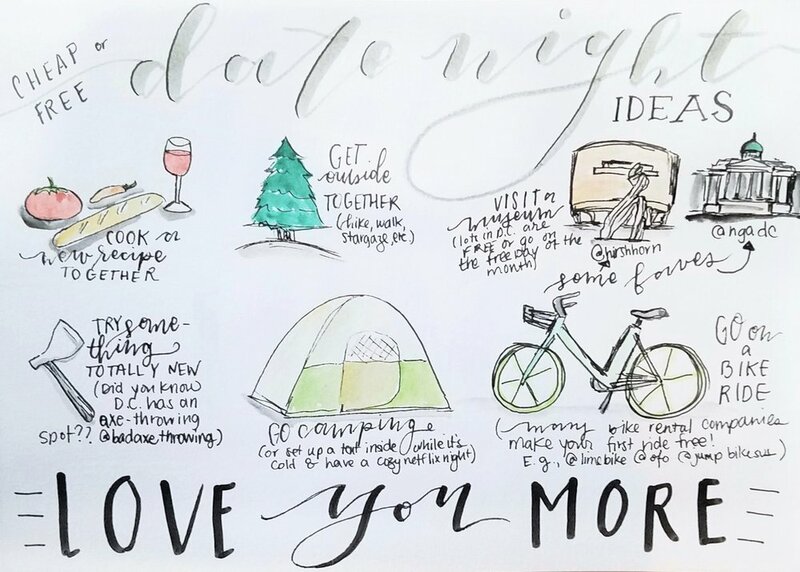 What are your go-to affordable date ideas? I'd love to add more to our list! I've been illustrating my packing lists for a while now and it is one of my favorite traditions. I used to hate packing, but now I kind of look forward to it because it helps me visualize my outfits and gives me an excuse to draw tiny clothes and traveling essentials. The last time I posted one, one of my lovely Insta friends suggested that I post some outfit pictures from my travels to see how I styled the clothes I packed. I didn't have time to do all of my outfits from my trip to Phoenix, but my long-suffering husband took photos a couple photos for me. So here goes... facing my fear of having my picture taken head on! Here's a second picture to see the full outfit. I like to travel with separates that all pair together so I can reuse pieces. I ended up wearing these boots twice and the vest twice. The boots are thrifted from Goodwill, the vest is thrifted from ThredUp (similar here, this is seriously one of my favorite sites EVER), and the dress is from asos (purchased a while ago, it doesn't look like it's available anymore). The weather in Arizona was just beautiful. Definitely makes me miss the desert. I certainly can't wear this type of outfit (at least without a coat and tights) in D.C. this time of year! 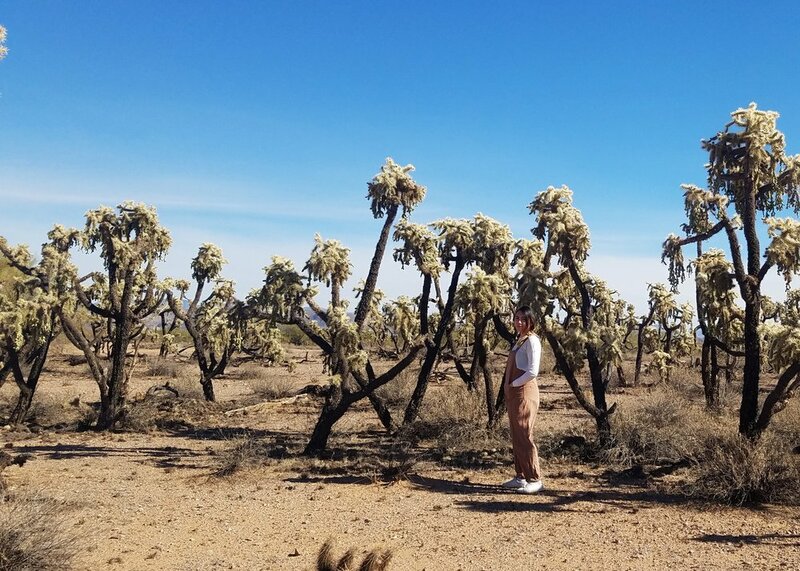 We spent a wonderful, beautifully warm and clear day with my family out in the desert. My family is very into the outdoors and adventure so we spent the day riding ATVs, hiking around, doing archery (my family has some interesting hobbies to say the least) and making food surrounded by the Superstition Mountains. It was FANTASTIC. I wanted something comfortable, but still stylish and unique. Poppy Apparel totally delivered with this super versatile jumpsuit. I seriously wear it all the time--it's so comfortable. It looks like it's also not available anymore, but if you want to check out their other clothes, I actually have a discount code for you all! Use code "desert2district" to get 10% off your order. In addition to this jumpsuit, I got an adorable high-waisted swimsuit that I can't wait to take on our next trip. Thanks for tuning in for my first style post! What are your thoughts--packing list or no packing list? I recently created my list of "18 in 2018" inspired by the wonderful Happier with Gretchen Rubin Podcast and I'm proud to say that I checked off the first item on my list--making side tables for our living room! My list is kind of all over the place, but quite a few of them relate to making our home more personal, intentional, and calm. One thing that can make our house less calm is having lots of clutter. My husband has nicely observed to me, "you sure have a lot of art supplies around the house" (and not quite as nicely says when other people ask where I make art: "Everywhere"). So, to try to manage the clutter making art creates, I made it a goal to make two simple, inexpensive side tables with storage capacity. Enter wood crate + sand paper + wood stain and ... voila! You've got a super simple side table. I'm really happy with how these turned out, and they cost a grand total of $15 each. I ordered two of these wood crates and this wood stain from Michaels (it's really easy to find 20% off coupons for Michaels as well so you can save even more). Then my husband and I set to work sanding them down. They were fairly rough, so you'll want to spend some time sanding before staining to make sure you don't get splinters when taking things out of your new side table if you make your own. After sanding, I used an old rag to apply the stain. The stain recommends adding some kind of sealant on top of this, but I haven't yet gotten around to doing that. At some point, we may also add legs to the tables, but for now I'm going to count these as DONE! I'm happy with them and my husband is VERY happy that my collage supplies are tucked away in their new home and not covering all of the available surfaces in our small apartment. Do you have a list of 18 in 2018? Are any of them to make something for your home? Let me know in the comments! I'm Heidi, the creator and owner of Desert 2 District Design. I moved to D.C. in 2015 after spending most of my life in Arizona. I absolutely love D.C., but found myself a little homesick and missing some of my favorite desert plants (cacti, of course), the endless sunshine, and the laid-back vibes of the Southwest, so I started painting as a way to unwind and to bring some of the desert to my new home. It's been almost a year since I started my Instagram account, and I've been so surprised and grateful to find this beautiful and supportive community of artists and art lovers. If you know me from Instagram, you probably know that I love to paint (mostly watercolor), letter, bullet journal, and collage. I'm hoping to share more of my art here, but to also share more of myself--my love of travel, reading, cooking delicious vegan food, and yoga. I hope you'll follow along and say hi!